Designed by someone who decided there weren't enough games about throwing hats around. For 2-4 players "of all ages." 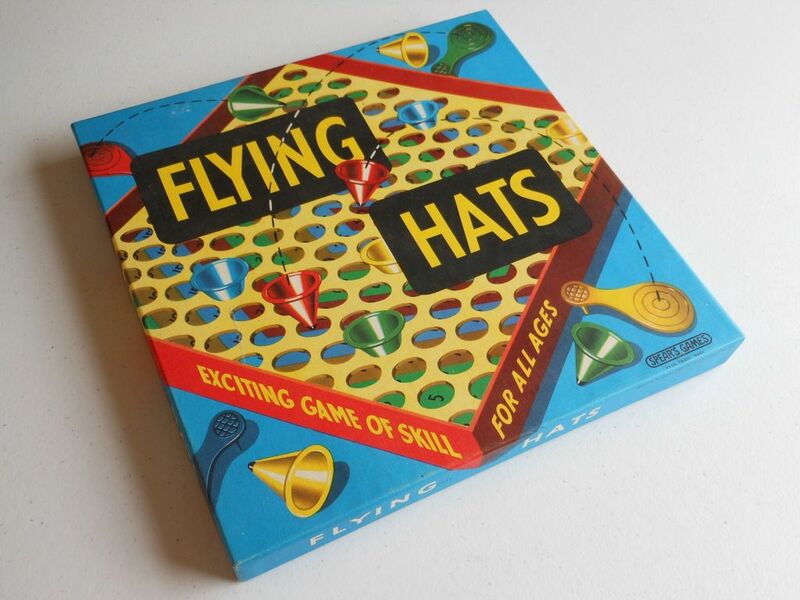 I have a very good friend who has told me that, as interesting as my blog is, it won't be worthy of his consideration until I have reviewed Flying Hats, which he (rather unusually) seems to think is one of the greatest games ever made. I have no idea why a game about flipping little plastic hats into a cardboard target should be worthy of such high praise, but who am I to ignore the request of a friend? So, here it is... Flying Hats. No need for instructions - the box art tells you how to play! This game actually dates back to some time in the late 1800s. It has been published by many different companies, and under many different names. The edition I have (picked up in a charity shop by my lovely wife, who indulges my hobby rather more than she probably should) was published by Spear's Games, probably in the 1960s or 1970s. 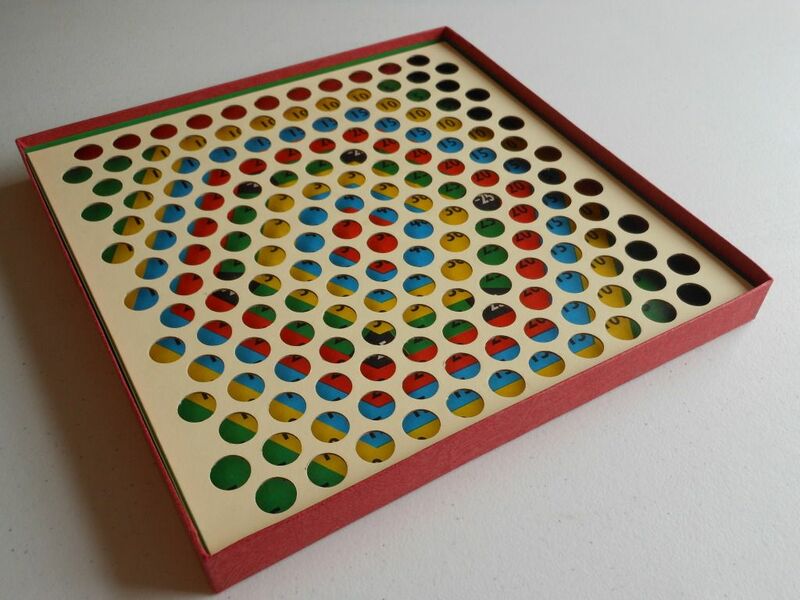 The version I have comes in a shallow, square box, the bottom half of which, in conjunction with a cardboard insert, forms the playing surface. You see, there are holes in the cardboard insert, and printed inside the box so that they line up with those holes are coloured targets marked with different scores. Inside the box for Flying Hats - it's like a piece of modern art. 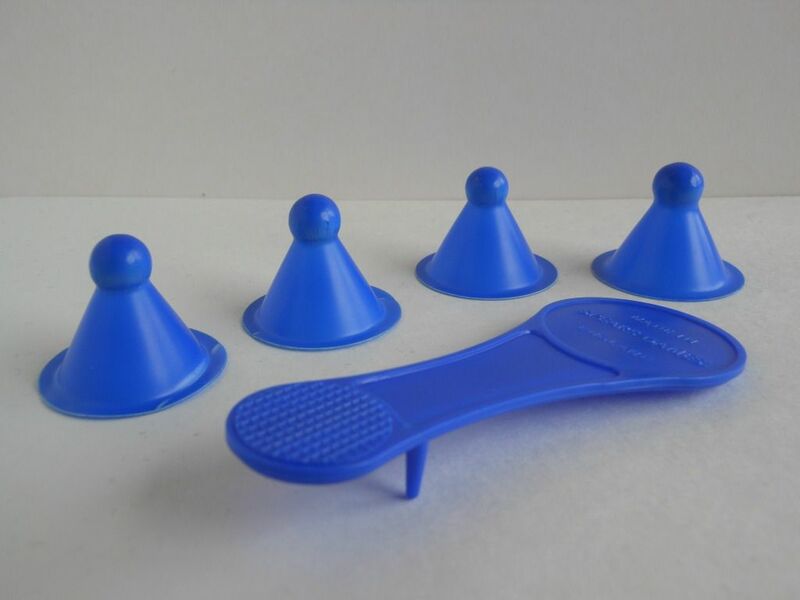 The only other components are four sets of plastic hats (four to a set), in four different colours with matching plastic flippers. The instructions are printed inside the box lid. Remember when games used to do that? I'd love to see Fantasy Flight Games trying to print the instructions to one of their games in a box lid! Rules include advice on adjusting your position and the strength of your stroke. The basic premise of Flying Hats is simplicity itself. You have four hats and one flipper. You use the flipper to flip the hats onto the the cardboard insert housed inside the box. 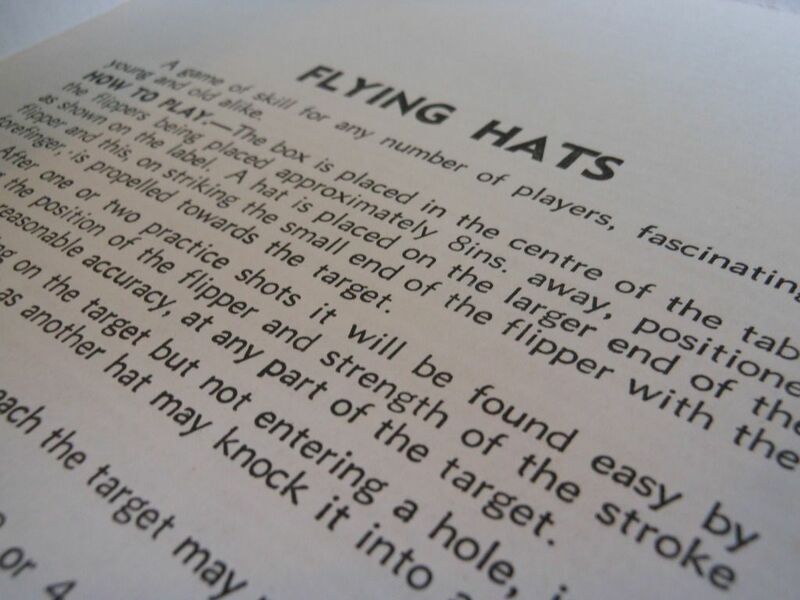 A good shot will see your hat falling point down into one of the holes in the insert, thereby scoring the number of points printed inside the box beneath that hole (the picture on the box cover gives a good indication of how this works in practise); a bad shot will see your hat bouncing off the insert, missing the box completely, or taking out the eye of your opponent. If one of your hats falls inside another player's hat, then you "capture" that hat and you score the points instead of your opponent. If one of your hats falls into a black space, then you deduct 25 points from your score at the end of the round. To make things a little more interesting, players do not take it in turns to shoot. Instead, everybody fires at the same time, and the person who fires all four hats first (regardless of where they land) gets a bonus 20 points. So, what you end up with, is a bunch of people frantically firing hats as quickly as possible, without any time being taken to aim. It's frantic chaos, and lasts for about 30 seconds per round. In that time, you might see one or two hats hitting a target; mainly, you will see targets hitting the wall, the floor, and the dog. After everybody has fired all four of their hats, you add up the scores (deducting 25 points for each hat on a black circle) and the highest total wins. There is an alternative set of rules that allows more players, by allowing each person to play in turn, and this adds the element of trying to hit the coloured targets with the matching coloured hats; but frankly, that's not very much fun. 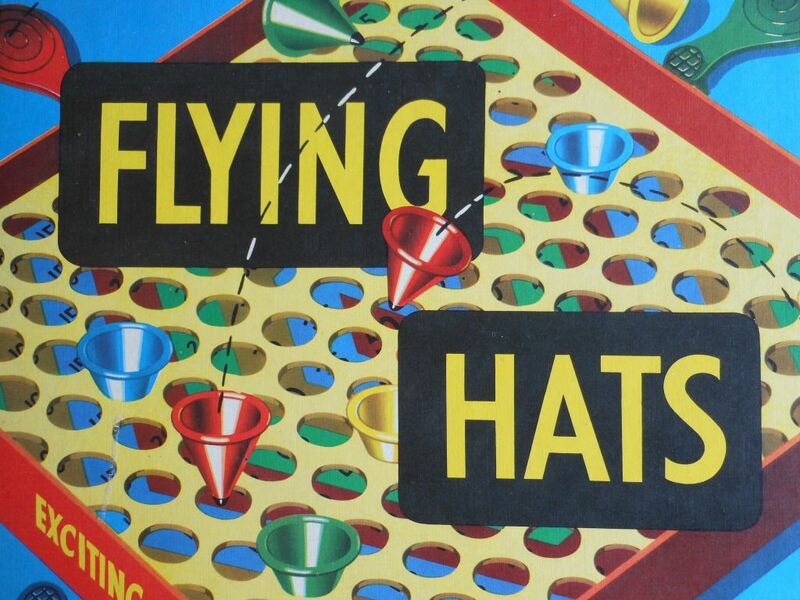 Flying Hats is a dexterity game that involves no strategy, no planning, and not a lot of skill. Rounds last no more than a minute, making it a perfect filler game. It's also good for parties, or gatherings involving "non-gamers." With the right group, you can have a lot of fun; but even then, this is a game to play for ten minutes at most. If you play for any longer, there really is a risk that someone will lose an eye. My copy, which is in immaculate condition, will be remaining in The Vault, and it will certainly see some use. There, I've reviewed the game. I hope my friend will be very happy. Yes! You reviewed it, and it was good! Thank ye! Thanks for stopping by. I actually quite enjoy this game from time to time, but like I said - you really wouldn't want to play for more than ten minutes. I like the sound of flying hats, I'm always looking for more fun games to play, especially with the kids!